Many engineers and product developers struggle with an overload of things to do when they need to get a real-time or application-rich product to market. DornerWorks’ SoloX SOM is a powerful processing platform that enables you to quickly develop a custom solution so that you can get back to focusing on what you do best. 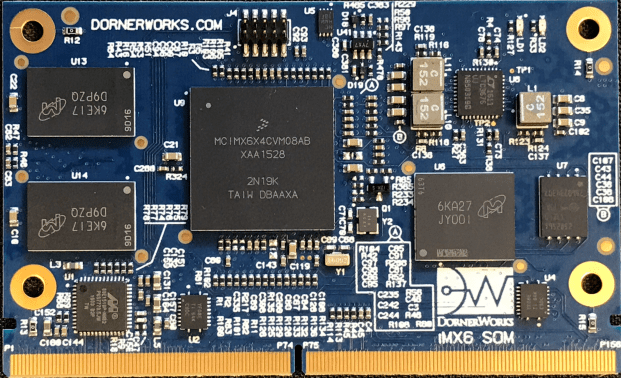 DornerWorks’ SoloX SOM platform is a feature rich, cost effective system on module solution featuring a highly integrated processor, NXP’s i.MX 6SoloX. Our SOM conveniently captures all of the complex design elements of a processing unit in a module, leaving the end user able to focus on the special aspects of a product. DornerWorks has a history of complex real time related products, a wealth of safety critical design experience in multiple industries, and a convenient location for the automotive industry. DornerWorks is a recommended design partner by NXP as an NXP Approved Engineering Consultant. Learn more about the flexibility, reduced time to market, and other benefits a SOM can bring to your embedded development work. Download our whitepaper and launch your project with confidence.